The Clippers told themselves they couldn’t make any excuses. Didn’t matter how physically tired or mentally drained they were from a seven-game trip. They had to find a way to win, just like San Antonio — a team Doc Rivers calls "the gold standard"– typically does. And the Clippers did, notching their largest margin of victory ever against the Spurs. Blake Griffin scored 27 points, hitting 11 of 15 free throws, in the 115-92 win Monday night, 48 hours after returning to Los Angeles. "The best part about this game was we knew what we had to do," Griffin said. "We executed our game plan. Even when they made runs nobody got down. That positive attitude is big." Chris Paul added 23 points, eight rebounds and seven assists, and Jamal Crawford had 17 points in his second straight start for the Clippers, who repelled several threats in the third quarter to maintain their lead. "Another good win for us coming off the road trip," said Paul, who won’t be dwelling on it. "We got to get past it." Tim Duncan had 17 points and 11 rebounds for the Spurs, whose four-game winning streak ended. Tony Parker limped off the court with a right shin contusion with 5:09 left in the third. He finished with eight points and six assists in 26 minutes, and didn’t speak with reporters afterward. Spurs coach Gregg Popovich said Parker was in pain and having trouble walking on it, so he had to be taken out of the game. 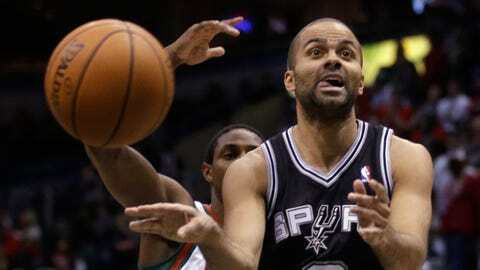 "He has the ball in his hands for a long time, especially when it counts the most," Manu Ginobili said about Parker. "So we couldn’t adjust to it and it was hard, especially against a team that is aggressive." DeAndre Jordan added 11 rebounds and Griffin had nine to help the Clippers control the boards, 43-36. Jared Dudley had 14 points, including four 3-pointers. Los Angeles went 4-3 on its road trip, closing it out Saturday with a 113-97 victory over the Washington Wizards. The Clippers didn’t practice Sunday before facing off against the Spurs, whose 19-5 record is third-best in the NBA. "It tells you they’re in it mentally," Rivers said of his team. "Very proud of them. I think they wanted to win very bad." San Antonio made one last run to open the fourth, getting consecutive 3-pointers from Patty Mills and Danny Green that drew the Spurs to 86-82. The Clippers dominated the rest of the way, stretching their lead to 106-86 during a 20-4 run that ended with three 3-pointers in a row: one by Willie Green and two by Dudley. Crawford put one last dagger in the Spurs as he dribbled down the final seconds before casually popping a deep 3 for the final basket. "We turned the ball over way too much (22 times) and went through bad stretches. We just can’t put games together like that and expect to win," Duncan said. "But it’s early in the season and we’re going to learn every one of these losses and continue to grow as a team. Hopefully at the end of the year, we’re a better ballclub because of it." The Clippers stretched their lead to 59-51 early in the third before the Spurs cut it to 59-58 after scoring eight straight points. Crawford, Griffin and Paul took over the rest of the third, combining to score the Clippers’ last 20 points and stretch their lead to 78-70 going into the fourth. Crawford launched the 20-12 run by hitting back-to-back 3-pointers. The Spurs got within three points on a layup by Ginobili before Griffin scored six of the Clippers’ next eight points to extend their lead. "It’s my job to keep feeding him," Paul said of Griffin. "I love it when he demands the ball. We’re going to keep playing through him every night." The Clippers trailed 28-21 after the opening quarter before unleashing a 19-0 run early in the second. Green bookended the spurt with 3-pointers, and in between five different Clippers scored to give them a 40-31 lead. Griffin scored their final eight points to send them into halftime leading 55-49. NOTES: Crawford started for the second straight game and just the second time in 102 games with the team. … Clippers F Stephen Jackson faced his old team for the first time since the Spurs released him last April. He was signed by the Clippers last week and had six points. … Popovich and some of the players, including Parker, didn’t arrive until about an hour before game time. "The sunset was great over Santa Monica, so we stayed a little longer," Popovich cracked.